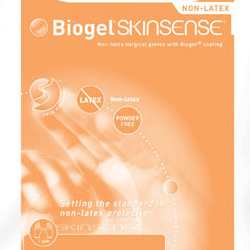 Biogel® Skinsense is the 2nd generation Biogel synthetic surgical glove used as an alternative to latex. Made from neoprene material, the Skinsense is 100% latex-free and recommend for surgeons who are sensitive to latex proteins. As the medical industry shifts away from latex material and powdered gloves, finding a material with similar characteristics to latex has been crucial. With the exception to being responsible for latex allergies over time, latex surgical gloves were ideal because of high sensitivity of touch and comfort the glove provided. Neoprene was introduced as the synthetic surgical glove to use as the material conforms the the shape of the hand well. Due to the strength of the material, the Biogel Skinsense is thinner than traditional surgical gloves without sacrificing the level of protection to the user. The Biogel Skinsense surgical glove has been used for some time by surgeons on patients who are allergic to latex. While the Biogel PI surgical gloves have become favored as the new synthetic glove of choice, demand for the Biogel Skinsense glove remains consistent since it is more cost-effective than polyisoprene surgical gloves.